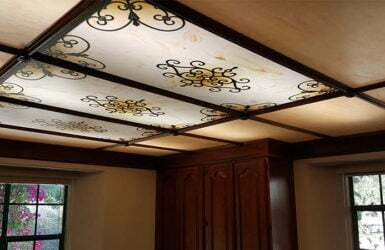 This magnificent custom ceiling is well described in our blog post. While we present several colors as suggestions, they can be modified upon request. To view this product in full detail (it is huge), we make use of the special viewer on the Jim Tarpo Photography website. You can explore the detail of this piece by clicking on the link below shown as Related Products. 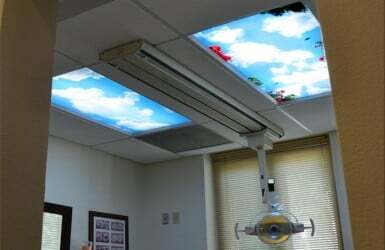 NOTE – The Prices shown for this ceiling are for square installations of one of the colors shown. If your entire installation is rectangular and you don’t want the artwork “stretched to fit”, it is necessary to customize the background grid artwork to fill in the extra space not occupied by the circular area of the design. For Single 2×4 – Click Here to see this special crop for standard light panels. Additional charges may apply for custom colors and custom sized background grids. Contact us for details. The Panel Brightness rating assigned to each design is based on the average luminosity (0-Black to 255-White) of the digital artwork file. It can be used as a guideline to predict artwork light reduction of one design compared to another. #5: Best designs for kitchens, bathrooms and other rooms requiring the brightest light. #4: Good designs for kitchens and bathrooms or in rooms where high light throughput is desired. #3: Good for most lighting locations. Can work for kitchens in conjunction with a lot of other light sources (i.e., windows or canned lights). #2: Not as dark as #1. Requires some task lighting in the room. Used commonly in treatment rooms. 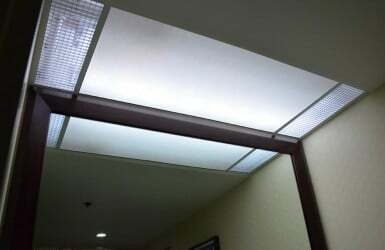 #1: This design selection is for ambient lighting only with several other light sources for tasks. 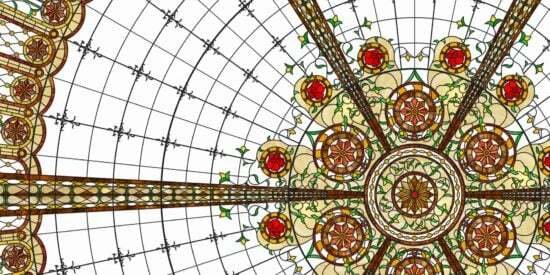 I loved the blue stained glass I ordered a month ago and I also absolutely love the Virtual Stained glass dome ceiling that just arrived! It makes my skylight box looks stunning! All my friends love them too. I am thinking about putting it in my apartments when I have vacancy too. I saw something similar to this when I was on a cruise. So glad that I found you guys! Specify the number of Rows and Columns of panels in your ceiling grid to calculate Total Panels Ordered. Enter the approximate dimensions of the entire arrangement in Total Installation Size. This clarifies the orientation of your panels, but you may leave it blank if not immediately available. Verify the Print Medium (acrylic) desired. Large sizes automatically select a thicker acrylic but you may override this. Add any desired Image Add-Ons (optional) to the arrangement. Additional specifications for your Sky Mural may be entered in Customer Instructions. If possible, measure the size of the panel you are replacing and enter it here, otherwise follow the guidelines for How to Measure page in order to determine the correct size. We proudly offer only the very highest quality acrylic products for our decorative prints. Any acrylic thickness may be selected for your artwork of choice on common or smaller panel sizes. For oversize panels, the recommended thickness of material (Print Medium) will be automatically selected at purchase, based on your size. You can override the automatic selection after entering the size, but it may result in some panel sag. .060″ Matte White – Our standard white acrylic has a slight matte finish to allow the print to adhere nicely to each panel. Though it is our thinnest material, it is at least 30% thicker than many light panels found available for purchase elsewhere. .080″ Lumieo – Normally for oversize lenses, this material is slightly less opaque than white, while still providing excellent light diffusion. It produces a beautiful result and is more rigid than .060″ matte white acrylic. We print on Lumieo upon request or when a larger panel size dictates it. .125″ Lumieo – A thicker version of our .080″. At nearly 1/8 inch thick, this is the choice for the largest prints we offer, or for applications that benefit from a stronger panel. This thickness holds up nicely in the center for panels up to 50″ x 50″. 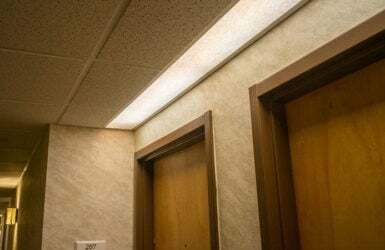 Although a more costly option, Lumieo products offer enhanced features and benefits, such as greater light throughput and bulb hiding capabilities. Contact us for pricing on 51+ panels or sheets over 17 square feet. The Quantity discount pricing above is applied when your complete order of all panel designs has been added to the Shopping Cart. That means everything in your cart. You will not see your total order savings until checkout time. Prices shown are for .060 White Acrylic. $100 Artwork Preparation: To prepare artwork for a single design in a custom size. $0 Additional Graphics Charge: If applicable, but only for complex designs ordered in a difficult aspect ratio. Example: Ordering some 2×4 designs in a custom size of 32 x 23 may result in this charge. A Per Panel charge related to the size ordered and/or thicker acrylic required. A 1-time charge of $15 for a custom-built package. Very large panels, requiring packages that exceed the FedEx girth limit, result in a 1-time charge of $110 per order (added at checkout). An important note on quality: This original panel design is a print on the highest quality flat acrylic available for your recessed lighting application. The panel ships in a protective flat box, similar to a fine piece of art (learn more). Our product is not back-lit film or thin acrylic rolled up into a small box or tube. We have meticulously chosen acrylic materials that meet our high standards for visual excellence. Should you require a custom size of this image, it will not be simply cropped, but carefully edited by our artists to preserve the design's full character.